Our hard-to-find micro-size needle files are 30 percent smaller than other files on the market, making them ideal for all types of intricate filing jobs. Used extensively by jewelers and instrument makers. Fine cut for use on wood, metal and plastic. 4 inches long with 1/16 inch dia. shanks. Includes FREE collet type handle for delicate control. Includes 12 files. 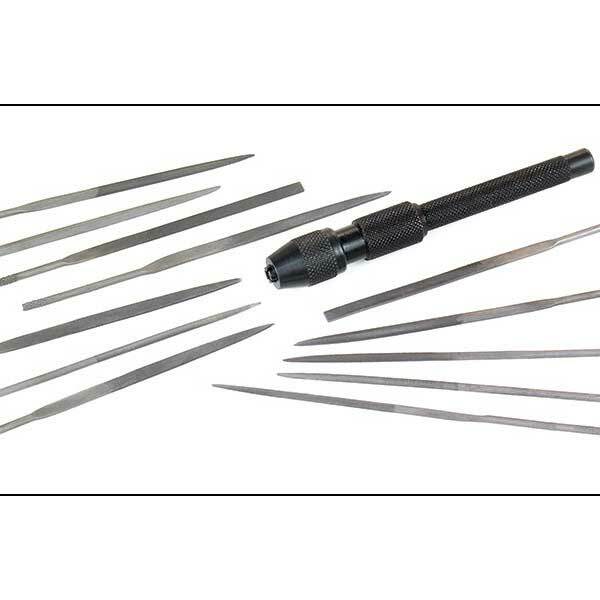 Perfect for deburring my tiny pieces after the initial cut or after soldering to the larger set. Gets into all those little nooks and crannies! !